Free Delivery in Europe above 85 euros. 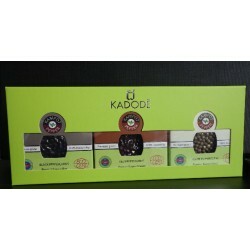 Kampot pepper Black 40g KADODĒ KAMPOT PEPPER BLACK has a strong character but yet a delicate aroma. After a first powerful peppery body taste, it reveals outstanding aromas of flower, eucalyptus and mint. 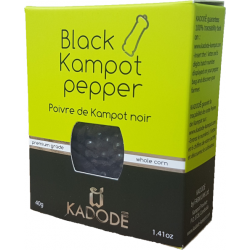 Kampot pepper Black 80g KADODĒ KAMPOT PEPPER BLACK has a strong character but yet a delicate aroma. After a first powerful peppery body taste, it reveals outstanding aromas of flower, eucalyptus and mint. 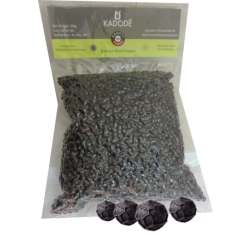 Kampot pepper Black 500g KADODĒ KAMPOT PEPPER BLACK has a strong character but yet a delicate aroma. After a first powerful peppery body taste, it reveals outstanding aromas of flower, eucalyptus and mint. Kampot pepper Black 1kg KADODĒ KAMPOT PEPPER BLACK has a strong character but yet a delicate aroma. After a first powerful peppery body taste, it reveals outstanding aromas of flower, eucalyptus and mint. 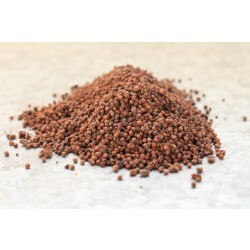 Kampot pepper Red 40g KADODĒ KAMPOT PEPPER RED delivers a powerful and fruity aroma. Its taste combines the spicy, mature flavor of black pepper with a sugary sweetness. 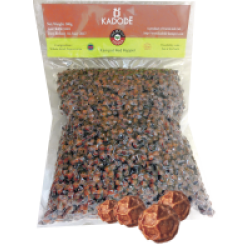 Kampot pepper Red 80g KADODĒ KAMPOT PEPPER RED delivers a powerful and fruity aroma. Its taste combines the spicy, mature flavor of black pepper with a sugary sweetness. Kampot pepper Red 500g KADODĒ KAMPOT PEPPER RED delivers a powerful and fruity aroma. 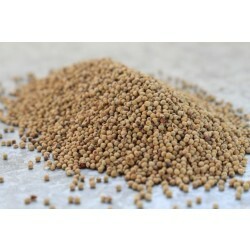 Its taste combines the spicy, mature flavor of black pepper with a sugary sweetness. 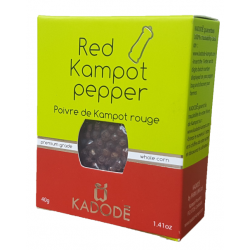 Kampot pepper Red 1kg KADODĒ KAMPOT PEPPER RED delivers a powerful and fruity aroma. 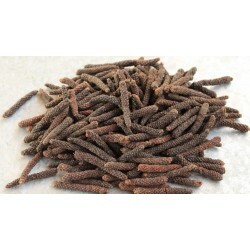 Its taste combines the spicy, mature flavor of black pepper with a sugary sweetness. 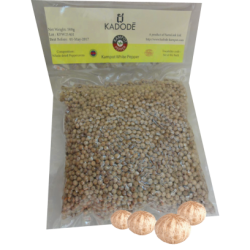 Organic Kampot pepper White 40g KADODĒ KAMPOT PEPPER WHITE delivers an intense bouquet and delicate aromas. Its strong spicy taste carries notes of fresh herbs and lemon. 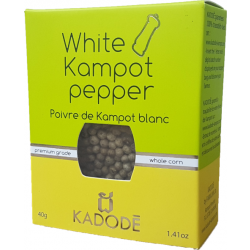 Kampot pepper White 80g KADODĒ KAMPOT PEPPER WHITE delivers an intense bouquet and delicate aromas. Its strong spicy taste carries notes of fresh herbs and lemon. 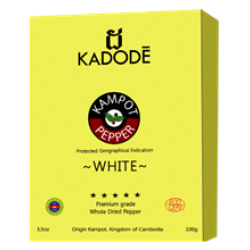 Kampot pepper White 500g KADODĒ KAMPOT PEPPER WHITE delivers an intense bouquet and delicate aromas. Its strong spicy taste carries notes of fresh herbs and lemon. 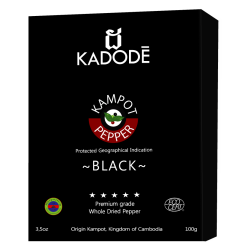 Kampot pepper White 1Kg KADODĒ KAMPOT PEPPER WHITE delivers an intense bouquet and delicate aromas. Its strong spicy taste carries notes of fresh herbs and lemon. 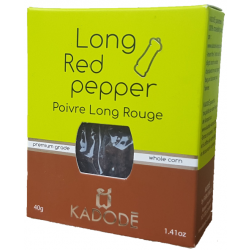 Long Red Pepper 40g KADODĒ LONG PEPPER RED develops at first a pungent taste, followed by a heat sensation, and finally some surprisingly complex hints of dried red berries, cardamom and nutmeg. 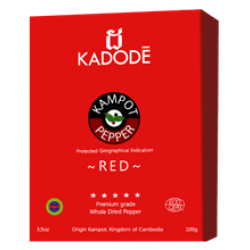 Long Red Pepper 500g KADODĒ LONG PEPPER RED develops at first a pungent taste, followed by a heat sensation, and finally some surprisingly complex hints of dried red berries, cardamom and nutmeg. Long pepper white pearls 1KG Perles Blanche de POIVRE LONG, premium grade, trié à la main. Origine Cambodge. UN POIVRE DE TERROIR Cultivé depuis 300 ans dans les jardins de poivre du sud du Cambodge. Sublimé par l’équipe de FARMLINK Kampot avec des standards inégalés de nettoyage, séchage et de tri. C’est un poivre 100% organique et entièrement récolté puis trié à la main. ’usage est très aisé, les petits grains ne nécessitant pas de passer dans un moulin ou un mortier. Son piquant se développe à la cuisson. 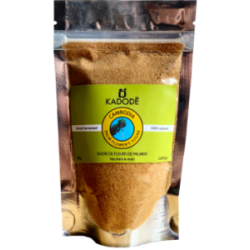 Palm Flower Sugar 80g KADODĒ PALM FLOWER’S SUGAR is a natural unrefined sugar, carrying a stunning blend of exotic aromas: vanilla, wild honey, coconut and sap. 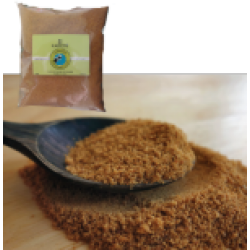 Palm Flower Sugar 400g KADODĒ PALM FLOWER’S SUGAR is a natural unrefined sugar, carrying a stunning blend of exotic aromas: vanilla, wild honey, coconut and sap. 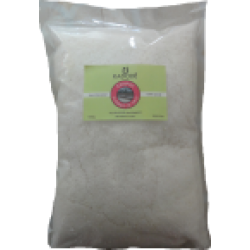 Palm Flower Sugar 1kg KADODĒ PALM FLOWER’S SUGAR is a natural unrefined sugar, carrying a stunning blend of exotic aromas: vanilla, wild honey, coconut and sap. 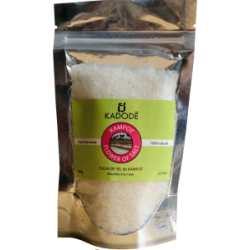 Kampot Flower of Salt 100g KADODĒ FLOWER OF SALT has a very mild salty flavor that reveals the taste of the food with great finesse. Kampot Flower of Salt 1kg KADODĒ FLOWER OF SALT has a very mild salty flavor that reveals the taste of the food with great finesse.